Continuing our discussion on speech in children with Down syndrome, today we’re going to explore speech sound disorders. Speech sound disorders may cause problems making individual sounds or difficulty with groups of sounds. Sounds can be changed, left off, or added. The two speech sound disorders we’ll focus on today are articulation disorder and phonological disorder. A child who has only one or a few sound errors may be diagnosed with an articulation disorder. For example, a child may substitute the “w” in the word red changing the word to “wed.” Even a few errors may make it hard for people to understand your child – especially if they don’t know the topic! The underlying cause for this type of speech disorder is largely unknown but in children with Down syndrome this may be related to structural differences in the mouth, persistent ear infections or fluid-filled ears, or other health problems that interrupt development. This type of speech sound disorder is different from dysarthria (muscle weakness), apraxia (muscle coordination), or phonological disorder which is discussed below. Traditional speech therapy focuses on individual sounds. Treatment may involve showing how to produce the sound correctly, teaching the child to recognize correct and incorrect sound productions, and practicing sounds in different words. The goal is for accuracy of each sound in all positions of the word (beginning, middle, and end), in phrases, sentences, and ultimately in conversation. Another type of speech sound disorder is called a phonological process disorder. This disorder is related to understanding and using the rules of speech production. As children grow they learn how to organize the sounds of speech. They listen to the sounds around them storing each in their mind. When they begin speak on their own children depend on the stored sound (s), combined with the rules they learned listening to mature speech, to produce sounds themselves. Children don’t start off with perfect speech. Instead, they naturally simplify speech as they are learning to talk – this is called using phonological processes. As they grow and learn the rules of adult speech they replace this child-like form of talking. If the child continues to use these processes past the age when it is considered developmentally appropriate they may be diagnosed with a phonological disorder. Treatment for phonological disorders involves targeting each process or class of sounds. This starts by targeting the group of sounds that mature or are established first. For instance, your child may leave the ending off of words (eat to “ee”) and glide sounds (changing “r” and “l” to “w” and “y” – like love to “yuv”). So the SLP would first establish a goal to have the child produce final sounds, then later address the process of gliding. 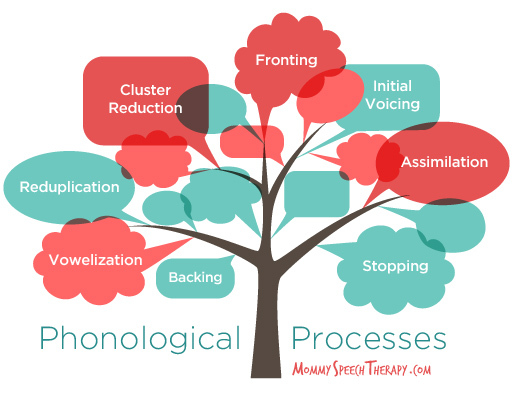 Heidi at Mommy Speech Therapy has a very nice post with links to treatment ideas for phonological disorders. Phonological disorders are not related to difficulty producing sounds because of muscle weakness or poor coordination. Rather, the child exhibits difficulty organizing sounds and understanding the rules that govern their production. Ultimately it’s a language problem. This is why techniques that focus on strength or coordination often prove ineffective when trying to improve speech accuracy. In children with Down syndrome, improving working memory may have a positive effect on speech production as the child uses more complicated words and sentences. An SLP with experience in speech sound disorders will help differentiate these disorders. It is crucial to have an accurate diagnosis in order to effectively improve your child’s speech. We will continue our series on speech disorders looking at apraxia and stuttering in upcoming posts. Thanks for the explanation. I look forward to further posts.